Sir David Henderson was an officer in the British Army who came to be considered as the leading authority on tactical intelligence during the early years of the 20th century. Henderson's works on Field Intelligence: Its Principles and Practice (1904) and The Art of Reconnaissance (1907) consolidated his reputation as a leading authority on tactical intelligence. "I wish particularly to bring to your Lordships’ notice the admirable work done by the RFC under Sir David Henderson. Their skill, energy, and perseverance have been beyond all praise." Henderson learned to fly in 1911 at the age of 49, becoming the world's oldest pilot. 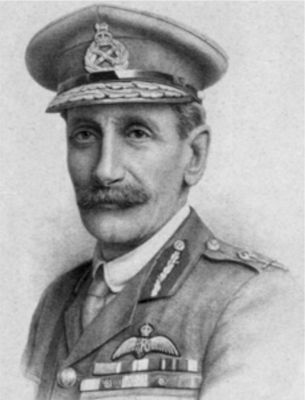 He was appointed Director of Military Training in 1912 and Director-General of Military Aeronautics in 1913 and became the first commander of the Royal Flying Corps (RFC) in the field on the outbreak of war. In August 1915 he handed over command of the RFC to Brigadier-General Hugh Trenchard but he fought for its autonomy and was instrumental in establishing the Royal Air Force as an independent service on 1st April 1918. World Changing Project, "Establishing the Royal Air Force," in University of Glasgow World Changing (University of Glasgow, 2010); http://www.worldchanging.glasgow.ac.uk/article/?id=59 (accessed April 26, 2019). World Changing Project. "Establishing the Royal Air Force." In University of Glasgow World Changing. University of Glasgow, 2010. http://www.worldchanging.glasgow.ac.uk/article/?id=59 (accessed April 26, 2019). World Changing Project. "Establishing the Royal Air Force." University of Glasgow World Changing. University of Glasgow, 2010. 26 April 2019 <http://www.worldchanging.glasgow.ac.uk/article/?id=59>.